Illness, Nostalgia and Excitement. When I was a kid, I’d often catch a flu on Christmas Eve from pure excitement. I recall leaning on my mum’s shoulder in church with a head burning from fever, not being able to eat more than a few mouthfuls of her delicious traditional dinner of perfectly roasted duck, red cabbage salad, white boiled potatoes, halved boiled apples with a dollop of redcurrant gel in the middle and rice pudding with almonds (all chopped up except for one lucky nut – the lucky winner of which would receive ‘the almond gift,’ a silly but always thoughtful and funny little thing) and cherry sauce and dozing off as soon as we’d danced around the Christmas tree singing the first verse of each of my favourite Christmas songs and opened the mountain of wonderful gifts below the glowing branches… weak, achy and coughing the night away, year after year. Simply because I’d been looking so much forward to that special evening. This year, my temperature was high and my bones aching all week leading up to Christmas, and it felt like a huge achievement packing and getting ready for our trip to India. For a brief moment right before we left for the airport, my emotional state was on par with my weak physical state. I got hit by a severe wave of homesickness: memories of walking and playing in the snow, ice-skating in London, coming home from Copenhagen or London for Christmas, hygge in my parents’ livingroom with red wine and Christmas music, that specific ambiance in the white churches, that specific menu, the fragrances of special foods, pine, candle wax and a chill in the air… Tears started welling up in my eyes and streaming down my face. At first, I attempted to hold them back and stop being so silly, but then S stepped in to comfort me, silently hugging me, and I let it all out. I felt grateful and excited about going to India; about getting to meet his family and spend Christmas with them; about an exotic Christmas. I didn’t regret my decision to travel to Goa instead of Copenhagen at all. I’m a grown woman, the world is so big and full of rich cultures, I have a pretty privileged life and am surrounded by love. BUT … I just needed a moment to sob and think about how much I missed my family and friends and traditions and freezing cold temperatures in Europe. He kept on hugging me tightly, smiling kindly and saying that he was happy to see me express what I felt. After a few minutes, my tear ducts were drying out again and I was able to laugh at myself. Goa. When I told my boss I was going to spend Christmas in Goa, her face lit up and she said it’s Heaven on Earth. Born in Bangalore and living in Boston, she has travelled extensively in both of her home countries as well as most other parts of the world. Trusting her verdict, I was very excited to go – and am now very inclined to agreeing with her. The small hippie state with beautiful coastlines stretching along the Arabian Sea was a Portuguese colony until 1961, which is evident in its stunning 17th-century churches and cathedrals, colourful roadside villas and mansions and tropical spice plantations. The S’s sister-in-law’s parents live on a small island, Divar, in the river Mandovi, and they were the ones who’d invited everyone – us, their daughter and her husband and kids as well as S’s parents – to celebrate Christmas with them. As there’s no bridge between the mainland and the island and the only way to enter it is via two small ferries going like slow pendulums between the two coasts with a maximum load of about four cars and a dozen motorbikes, the island is a lush, tranquil, serene paradise free from (other) tourists, commercial aspects, highrises. 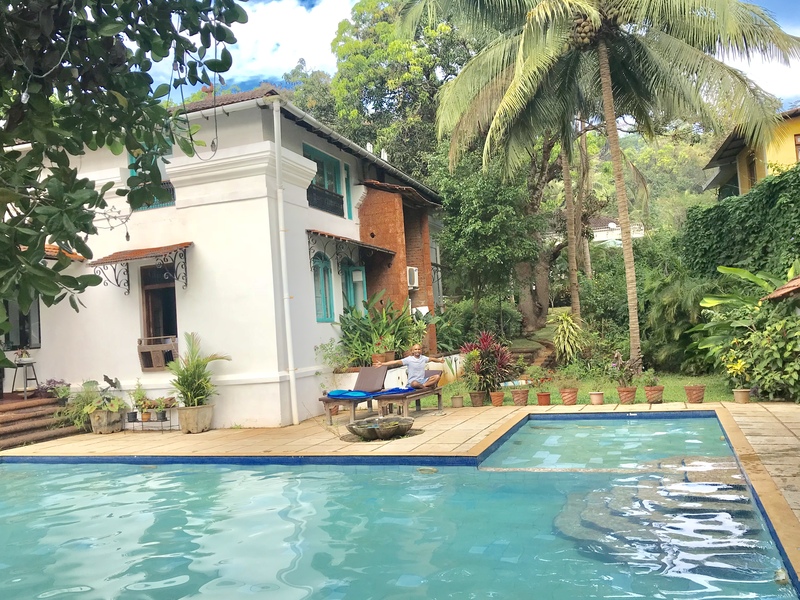 A lovely place to be together as a family, relax and enjoy the holidays and to embark on small excursions from – to nearby Panaji, the Saturday Night Market up north and the pristine beaches down south. For a week and a half, in Goa and Kerala, we were looked after like a pair of spoilt kids – picked up from and driven to airports, put up in nice accommodations, served delicious local food every few hours and taken on interesting adventures… everything was smooth, loving and enriching – new, exciting and familiar at the same time. Island Living. Very thoughtfully, S’s sister-in-law had checked S and me into a lovely Guest House, a few kilometres from her parents’ house where everyone else was staying. I love the family, and it was nothing but relaxing and fun to spend time with them, connect with them, get to know them, but it was nice to have our own space. In the mornings, we’d do sunrise yoga on the roof, I’d swim 50 or so laps in the chilly pool water, S would meditate and we’d have fresh fruit and our own homemade mysli for breakfast by the pool. Then we’d walk or drive past the rainbow of Portuguese villas, which all had giant paper Christmas stars hanging from roofs and awnings, and rice paddy fields to get to the family house. At night, after several hearty meals around the circular dining room table or in the gazebo at the back of the garden between palm trees and rice paddy fields inhabited by a peacock family, games of Scrabble on the verandah, snoozing and reading (I read The White Tiger, wonderful, hilarious book!) in hammocks shaded by palm trees in the garden and excursions around most of Goa, we’d drive back to our pretty abode, sometimes accompanied by a kid – S’s niece and nephew took turns sleeping between us, and then we’d wake up and play in the pool, play chess, sketch houses and superheroes and fold Christmas stars from slips of paper I brought from Denmark. Serendipity Arts Festival. When we landed in Goa, we were taken straight to a jazz festival, which was part of the multidisciplinary arts festival in Panaji, bringing together visual, performing and culinary arts. S’s sister-in-law’s dad showed us the stalls selling masala dosa, biryani and cold Kingfisher beer and then took us to the spot in front of the huge stage where the rest of the family was waiting for us. Wonderful introduction to this lively, creative part of the world! We also went to see several painting and sculpture exhibitions around town as well as a small, funny play, Quality Street, based on the short story by the award-winning Nigerian novelist Chimamanda Ngozi Adichie, who also wrote one of my all-time favourite novels, Americanah. Fabindia. We also went shopping. All of us. For beautiful dresses, tunics, shirts and vests in simple styles made from natural fabrics and traditional, hand-based techniques. For dried mango and pineapple and Ayurvedic teas and ointments. For ceramics and woollen bed spreads. Linking over 55,000 rural craftsmen and -women to modern urban markets, Fabindia creates a base for skilled, sustainable employment (of designers, artisans, farmers, makers, various kinds of entrepreneurs) while preserving India’s traditional handicrafts. My new favourite store, haha, which we frequented in Goa as well as in Kottayam and Kochi the following weeks. They actually also have an outlet in Singapore, but I’ll try not to go there – there’s a certain charm to just buying clothes locally (and when needed): my friend Alicia’s clothes here in Singapore, my favourite yoga pants and swim suits in Australia and Danish design when I’m at home. Saturday Night Market. One evening, we drove up north to the most gigantic, sprawling, energetic open-air night market I’ve ever experienced. Charming layout, with bamboo stalls framed by trees, and slow-moving crowds of hippie happy people. We got food (I bought a falafel wrap from a stall owned by a Danish girl and her boyfriend from Kerala, haha) and beers and meandered about, checking out the impressive array of goods. The kids got tubes of henna colour, and on the way home, I got a beautiful C painted in my palm. Beach. On the 24th, we drove down south to a wide and almost white beach. We had lunch at a restaurant overlooking the ocean, after which S and I went swimming and playing in the waves with his 9-year-old niece for a long time. So much fun… she and I then went about collecting shells, the most remarkable ones being the delicate, purple angle wing ones on the photo below. Christmas Eve. While in Denmark everyone was eating duck, watching the last episode of the advent calendar show on tv and singing songs and unwrapping gifts by the Christmas tree, we spent the Eve of the 24th grilling mackerel by the gazebo and playing with the kids, whose toy elf Elfina had left for the Northpole to help Santa get ready for his journey. Even when I spent Christmas in Bali last year, I was with a German friend who also thought of the 24th as the highlight of Christmas, so this was the first time ever I got to go to bed on Christmas Eve feeling that some of the best about the season was yet to come. Sounds like a great trip, and looks like a beautiful place to visit! I have heard so much about Goa. I am from Kerala and currently living aboard. I never got the chance to visit this beautiful place. Sad to say I got to the aesthetic of this place by watching Dil Chata Hai. I know watching the movie does no justice of actually going to see the place in person. I would love to visit this place one day. Hope you get to visit Goa sometime – it is indeed beautiful, as is Kerala!